Overall MBH has coordinated 3 workshops in Adelaide. 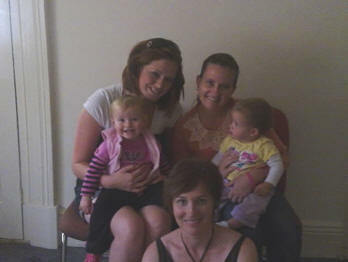 The first one was pilot workshop to gauge what topics were most relevant for mothers. The other 2 workshops were as a result of this pilot process. 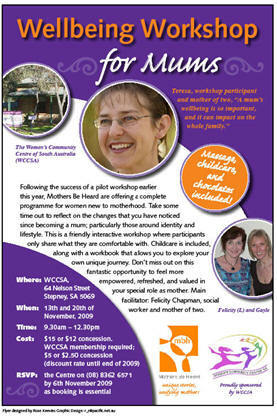 The Women's Community Centre of SA at Stepney kindly hosted and sponsored this initiative. 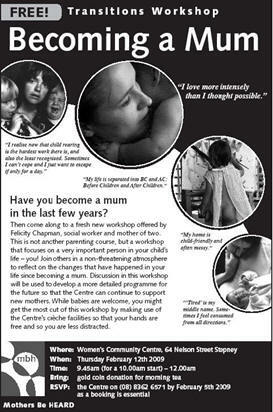 “So many groups focus on the practical sides of motherhood that looking at the meaning of it would be great. There are many groups that look at practical tips but very few opportunities to explore emotional changes in a group setting. This would be very valuable.” (Participant feedback for February 2009 pilot workshop). “I want to think more about how parenting has changed my life. You get so caught up in the day-to-day realities it’s hard to find time/space to reflect.” (Participant feedback for February 2009 pilot workshop).